Walter Sitlington wanted to feed the world. As a farmer and rancher, he understood the importance of agriculture and veterinary medicine in addressing world hunger. It led the Oklahoma City man who never attended college to give OSU the largest donation it had received from an individual up to that point. When he died in 1995, Sitlington left $9 million to OSU. The donation established seven endowed chairs for research in agriculture and veterinary medicine, along with creating multiple scholarship funds. Those scholarships are more beneficial every year, including awarding nearly $105,000 to students during the 2012-13 academic year. Sitlington was quiet and frugal. People often saw the bachelor wearing overalls and driving an old pickup truck. He slept on a mattress on the floor and braved Oklahoma summers without air conditioning. He was also known for his passion for people. He farmed land in Oklahoma and Kansas and would help friends and farmers overcome common agricultural problems. Sitlington was the grandson of Oklahoma pioneers Rufus M. and Elizabeth (McKeage) Bailey, and Walter L. and Charlotte (Belt) Sitlington. The younger Walter Sitlington wanted to help future generations continue the tradition of contributing to the food supply, especially as population increased. He bequeathed his estate, including 2,085 acres, to OSU. He placed a special emphasis on feeding the world and preventing farm-animal diseases. Nearly 20 years later, the faculty members holding Sitlington chairs are dedicated to doing just that. Bill Raun, who has been at OSU 23 years, has held the Walter Sitlington Chair in Agriculture since September 2010. With Randy Taylor, a biosystems and agricultural engineering professor and extension machinery specialist, Raun has spent 12 years creating a hand planter for developing countries to increase crop yields and reduce farmers' exposure to chemicals. The planter could be especially important in the developing world where virtually all crops are consumed in-country. "It will not only provide more food for that country, the farmers will make a profit," Raun says. "That profit may be enough to put shoes on their children's feet." The idea came to him during the six years he spent working in Central America, where many farmers rely on manual labor. They use metal-tipped persimmon sticks to dig a small hole and place multiple seeds in the depression before covering it. Raun says the practice decreases yields because of interplant competition. When multiple plants emerge at the same location, they compete for moisture and nutrients but fail to produce grain. Another downside is the farmers' exposure to seeds treated with chemicals linked to cancer. "This planter gets the seed out of the farmer's hand and keeps the seeds from competing with each other," Raun says. The planter mimics the traditional farming method. It can be used for any type of seed and doubles as a midseason fertilizer applicator. The Sitlington funds allow Raun to recruit students from developing countries to work on the planter. Doctoral students Sulochana Dhital, of Nepal, and Natasha Macnack, of Suriname, completed master's degrees in plant and soil sciences at OSU and have been working with Raun on the project. "Coming from a developing country, I can see the benefits of using this hand planter," Macnack says. "We are taking technology, making it applicable and increasing yields for a growing world population." Raun says Sitlington would be thrilled to know the advances his contributions made toward feeding the world. "It is a gift to be working on this project," Raun says. "This is what drives me to get out of bed each day." Katherine Kocan, who has been at OSU 40 years, has held the Walter R. Sitlington Endowed Chair in Food Animal Research since its establishment in 1995. Her research on ticks and tickborne pathogens has earned numerous honors and recognitions such as being a dedicatee of the Ninth Biennial Conference of the Society for Tropical Veterinary Medicine and recipient of the Pfizer Award for Research Excellence in 1986, 1996 and 2010. Katherine Kocan, the Walter R. Sitlington Endowed Chair in Food Animal Research, and D.L. Step, an OSU Cooperative Extension veterinarian, stand in the Willard Sparks Beef Research Center with a cow in a chute utilized when vaccinating animals. Kocan and Step collaborated on one of the first bovine tick vaccines. With funding from the Sitlington chair, Kocan and her team described the development of Anaplasma marginale, the bacteria that infects red blood cells and causes bovine anaplasmosis. Cattle with anaplasmosis develop severe anemia, which results in large production losses. Kocan's team also developed a cell-culture system for the pathogen that has advanced basic research without the use of cattle. The cell-culture system, used worldwide, has been adapted for research on several other tick-transmitted pathogens. Kocan utilizes the endowment to fund her research team, buy equipment and subsidize the research. "Mr. Sitlington had amazing foresight," Kocan says. "He really understood the needs of the future and what we could contribute to agriculture for the good of all." Kocan's team has made good progress toward developing a vaccine to control tick infestations and reduce tick transmission of diseases in cattle. José de la Fuente, who had been part of the OSU research team since 2000, developed one of the first tick vaccines for cattle. It is used in many areas of the world. "I wish Mr. Sitlington was alive today so I could thank him for his foresight and his contribution," Kocan says. 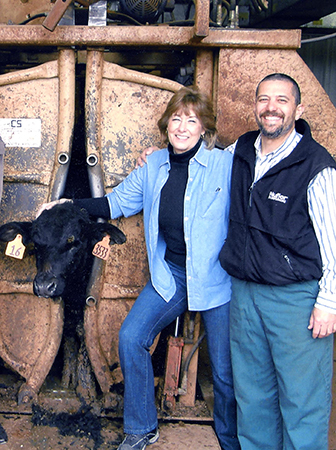 Sitlington's gift led to another breakthrough for cattle research in 2012. Anthony Confer, who has held the Walter Sitlington Endowed Chair in Food and Fiber Research since 1995, led the team that discovered that the major cause of severe pneumonia in cattle, Mannheimia haemolytica, produces an outer membrane vesicle. That meant a vaccine could be produced inexpensively. Bovine respiratory diseases cost producers nearly $1 billion annually. This is an especially important concern in Oklahoma, where beef cattle is a major industry. Confer's research was made possible by Sitlington funds, which support salaries for technical and research staff. "I am fortunate to hold this position," Confer says. "If I could talk to Mr. Sitlington today, I would give him a hearty thank you for his generosity." Carey Pope, who has held the Sitlington Chair in Toxicology since its inception in 2000, investigates the effects of pyridostigmine, a drug used to protect soldiers against nerve agents. He is also researching the effect of pesticides on children's health. "I'm very grateful for Mr. Sitlington's contributions and this honor," Pope says. "It has had a substantial impact on my career and research in toxicology." William Barrow, the Sitlington Chair in Infectious Diseases, has received continuous federal funding and grants from the National Institutes of Health and National Institute of Allergy and Infectious Diseases for his research on anthrax made possible by Sitlington funds. He has received several multimillion-dollar grants in the past 12 years. Those grants in turn provide monetary benefits for the entire university. Anthrax research by Barrow's team has led to a new antibiotic that is currently being studied. "Thanks to the vision of Mr. Sitlington and his generous and altruistic contributions to OSU, my team has remained a viable part of the Emerging Infectious Disease and Biodefense Program," Barrow says. "Subsequent activities from this chair have resulted in tangible benefits to OSU, the state and our nation." Sitlington's large gifts are dwarfed by the impact they have had over the past 20 years. "As a land-grant institution with a rich tradition in agriculture and veterinary medicine, OSU has spent more than a century working to feed the world," says Kirk Jewell, president of the OSU Foundation. "Thanks to Mr. Sitlington's incredible vision and generosity, we are making great advancements in that area."